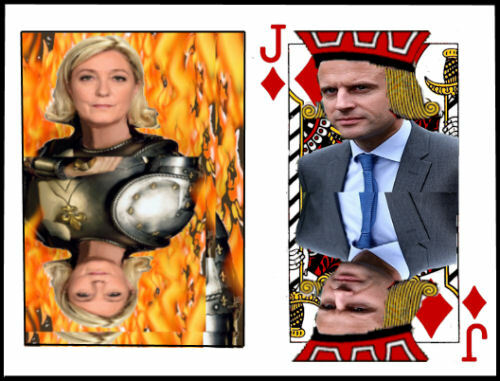 Marine Le Pen used the third presidential debate to lay out to the public the political misdeeds of Emmanuel Macron that the French and international mainstream press have preferred not to highlight on their favorite candidate. She began the debate on the offensive and hardly moved from that position the whole way through. Le Pen's barrister training was well in evidence as she used cross examination techniques on Macron, who initially stared back hostilely at her, expostulating feebly. "A 'present' Monsieur Macron?" she echoed back at him, when he accused her proposed cost-savings from EU costs as being a 'present' to the French, "Did you call giving back to the French their own money as a 'present' ?" You could see that Macron, for all his training, was becoming overheated. "Your getting very angry M. Macron." "I can see you're getting very angry, M. Macron." Macron's principle technique was to accuse Le Pen of silliness and ignorance on matters of recent history, economics and tax policies, but Le Pen often seemed better versed in the details of these matters than her opponent, convincingly citing a multitude of documents and instances whilst Macron had none to hand. She accused him of accepting finance from fundamentalist Muslim leaders in France who had championed the death penalty for homosexuals. Although he ducked and weaved, the shocking and documented accusations diminished him. The implication is that Macron is part of an EU policy for mass immigration to France which will have the effect of islamicizing France. Macron began by attempting to defend his globalist policies as forward thinking, in line with comparable countries, and as inevitable. For Australians who can understand French, we have heard it all before, the hollow promises of enterprise bargaining as a solution for unemployment. We have seen our industrial protections destroyed. Macron's program is the anglophone economic program of the early 1980s. Mme Le Pen called him out for what it was: " Pitting one company against another [in the global economy] so that they give away all their workers' rights and so that the big ones win because the little ones cannot survive." "You are very good at defending the strong by attacking the weak, M. Macron." Macron: If we drop out of the EU and lose the Euro, peoples' savings will suffer. Mme Le Pen: Like the Greeks? To the contrary we need our independence so that I can stand up for the French and fight against the banks if they try to take French peoples' money to fix their own debts. "I am the candidate for purchasing power. You are the candidate for buying up things, for, in your society, everything is for sale, men and wombs. You only see human relations according to the money they can bring. That is not my vision at all." MACRON: "I refuse to take orders from Putin! That's the difference between me and Madame Le Pen. LE PEN: [Putin] has asked nothing of me! The greatest danger today is taking orders from the European Union. Implying that Macron takes orders from the German chancellor, Mrs Merkel, Le Pen concludes: Whatever happens, France will be led by a woman on Tuesday: either by me or by Mrs Merkel. LE PEN: "There is a lack of balance between German and French relations . When relations are balanced, we are not submissive or enfieffed to Germany. War came from the kind of submission you are recreating. You are causing an economic submission to Germany and that is very serious. At stake are our sovereignty and our independence and the defense of the French peoples' interests." LE PEN: The world needs France to go back to her role of independent relations with other countries. There is no reason for us to not have good relations with Russia, nor for the US. We need to be heard in the world, the voice of independence, sovereignty, the voice of the people, or we will continue to be looked down on in the way Mrs Merkel has regarded us for years. Le Pen said that Macron has arguments twice as old as he is. He recycles Reganism that everyone else was over years ago. MACRON: "The big companies will save jobs ... enterprise bargaining. Competition. More flexibility for enterprises. Reform of unemployment benefits..."
LE PEN: "Minister of Economics, or should I call you Mr Holland's advisor? You were his advisor and the Minister of Economics for two years. If you knew how to solve France's unemployment problem, why didn't you avail President Hollande of your ideas in this? And if you didn't have any answers - because your results were extremely poor as regards unemployment - then why are you running for President of the Republic? It's the only real question that we should put to you, M. Macron. Because you were free to practice those policies and they were catastrophic because you did the only thing you know, M. Macron, you helped big business, as usual. You have no economic patriotism. We have to submit. Yours is a policy of submission. Le Pen talked about 'intelligent protectionism'. Macron said that terrorism is a problem for all developed countries, but you think we have to put the borders back the way they were to deal with it. In this debate, Macron was faced with the task of finding new words and enthusiasm to defend the economic globalisation program that has been going on for decades now and which most people hate. He also had to defend himself against his lack of French patriotism. Le Pen had the superficially easier task of throwing up examples of why we should get rid of this program, such as EU austerity programs and Merkel's mass immigration. The only thing - but this is huge - that Macron had on his side was that the mass media have promoted the globalisation program so repetitively over the years that they have normalised its flimsy ideological tenets. People who watch mainstream media and take their opinions from those it deems authorities will find it hard to resist Macron's economic banalities, especially the wealthier ones and the would-be-rich who feel they may be gaining from globalism. The media also give comfort to the idea that nationalism is really a kind of right-wing extremism. And they are pushing Macron for all they are worth. Le Pen pointed to how the establishment have carried Macron all the way. That the Socialist Party machine has been doing Macron's marketing strategy for him. Current President Francois Hollande (who is France's most unpopular president ever) has been spruiking for Macron, urging him to continue to carry on 'their' work. That Macron is the cherished child of the system and of the elites. That he uses cynical and shameful campaign arguments revealing behind them the coldness of the banker which he has probably never ceased to be. Perhaps anxious to make people forget his reported statement that France has no culture, Macron attempted to couch his economic policies in patriotic tones: "I carry the French spirit of conquest, because France has always succeeded in the world. Her language is spoken on every continent, her history, her civilisation shines everywhere. We are strong on the world stage, the 5th economic power. Many changes are going to be necessary and that is what I am going to do. Governments have been incapable of doing this for years, for 30 years, but I am going to do the maximum to remedy this." [...] "Do the French want the spirit of defeat that you are carrying? You explain to the French that globalism is too hard for us and too hard for Europe, so we are going to close the borders and get out of the EU and the Euro. Other people manage, but not us." After Macron won the first round of the Presidentials, nationalist Marine Le Pen achieved wide and positive publicity by talking to workers about to lose their jobs at Whirlpool (relocating to Poland) while Macron fraternised with their bosses behind closed doors. One wondered what Macron could possibly do to compete with Le Pen's success in gaining the limelight in this. The next day Macron very ostentatiously attended a ceremony to commemorate Jews who had been burned to death in a church during the Second World War. He was filmed talking to a man who escaped this fate and who said he was afraid that right-wing extremists might take over France again. Macron swore to protect him from this as if Le Pen posed an actual threat. In this third debate, Macron tried to identify Le Pen as anti-Jewish, but he was drawing a very long bow. Taking up a journalist's polemic talking point, he spoke of how French policemen had rounded up Jews during the Rafle du Vélodrome d’Hiver under the Vichy Regime and said that France needs to acknowledge this reality, as had Jacques Chirac and Hollande. Le Pen agreed that these events were 'shockingly horrible' but reminded Macron that there are two legal points of view as to whether these policemen were actually acting under a French government. She cited Presidents General De Gaulle, Mitterand and Chevenement who found that the Vichy Regime was illegitimate and that the real government of France was located in Britain with the Resistance and De Gaulle. "Leave De Gaulle out of it! Jacques Chirac recognised it," Macron snarled. Le Pen said that there are two points of view and no-one is bound by Chirac anymore than by another political leader's opinion. Furthermore, she said that anything that aims to diminish the responsibility of the Vichy Regime is a bad thing. She also implied that Macron had sunk to a new low in using Jewish persecution to try and get ahead politically. France does not have the same kind of wealthy zionist lobby that America has and Macron's apparent appeal to such a lobby seems symbolic of his allegiance to the US-NATO world politic. I have been taking quite an interest in the elections in France,following the televised French news on SBS for some weeks. People in Australia I speak to about it are under the impression that Marine le Pen is "far right" and no wonder as she is constantly described as such in the media. One friend even described Macron to me as "left wing"! Macron would not even describe himself as "left wing". I think he calls himself a "centrist". Surely these descriptions are the wrong way around? There is nothing in le Pen's utterances that I could describe as "right wing". 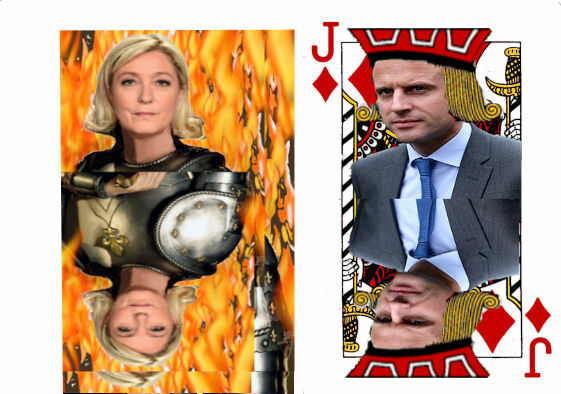 This mis-labelling creates in those with only a passing acquaintance the impression that Marine le Pen is "bad" and that Macron is the only alternative. Even avowed feminists of my acquaintance normally well disposed towards a female candidate (all things being equal , of course) dismiss le Pen as "far right".